true Physical Access Control recognition terminal using the cutting edge of biometric authentication technology, the PalmSecure™ - Palm Vein Recognition. ﻿Manufactured to meet the most rugged standard in the market, the IDT Sapphire™ is IP65 rated and anti - vandal casing. IDT Sapphire™ incorporates precision biometric technologies into ergonomic computer peripherals that deliver unparalleled performance, reliability and convenience. 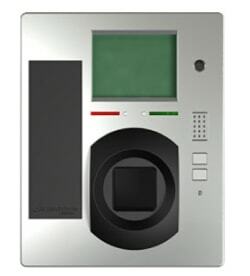 ​This Modular Physical Access Control Terminal integrates the industry best performing biometric technology offered in a rugged, elegant design, with the industry’s required interfaces, enhanced security and convenience. The IDT Sapphire™ is the perfect basis for a complete access, Identity Management and Time & Attendance solutions.